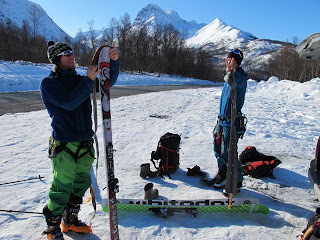 Yesterday the Sahlén brothers and myself went for another try of Jiehkkevarri, the highest mountain in Lyngen. 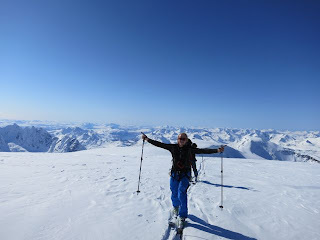 Exhausted from the last weeks big days and not extremely motivated for another early start and climb of Holmbuktstind we took of early morning. Weather being perfect with not a cloud on the sky we easily cruised to the top of Jiehkkevarri in 4,5 hours. 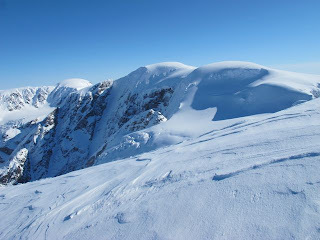 From there we skied down southeast to get have a look at our objectives: the South face or the east couloir of the mountain. 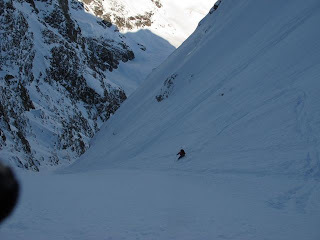 We took an hour to examining the south face (also known as the Arctic Brenva Face) from up close, but we didn’t feel like the risk equaled the rewards so we walked back up again and aimed for the east couloir instead, a beautiful line that doesn’t seem to have had been skied in its entirety before. 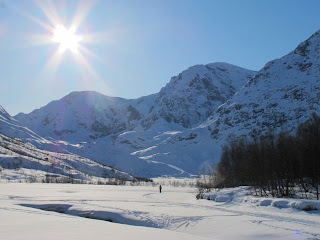 It turned out to be a beautiful preserved gem and offered us the best skiing we had for the whole trip! 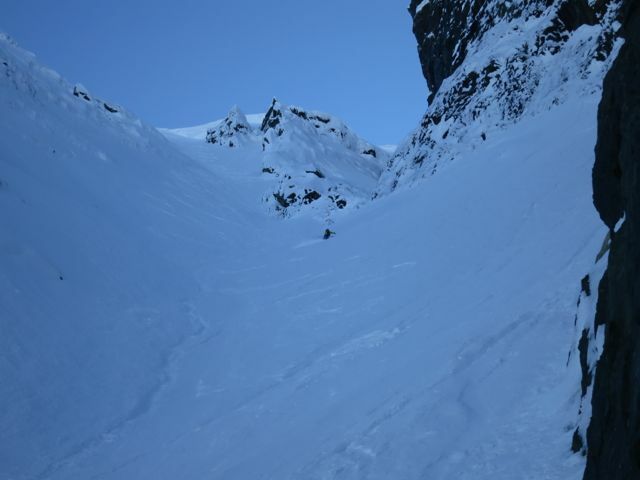 It’s an about 800 vertical meter couloir with a big mountain ambiance totally hidden away from the normally busy (for Lyngen standards) summit. 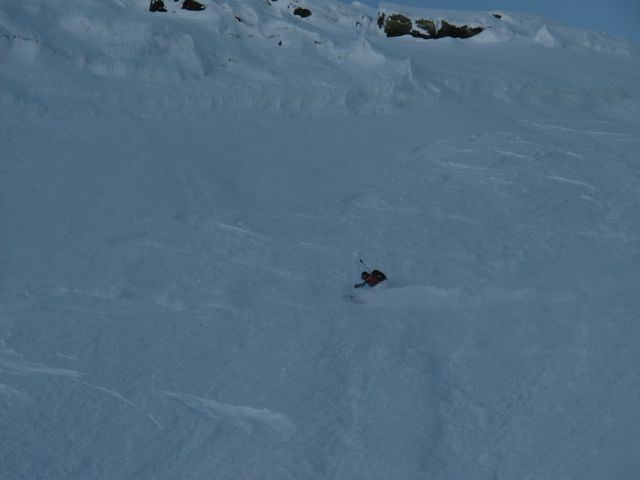 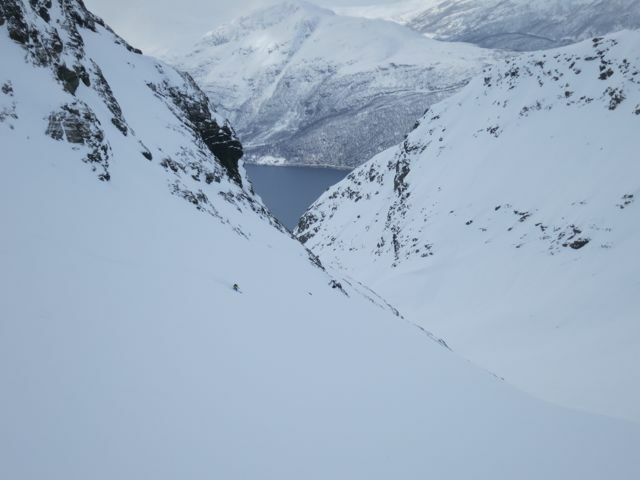 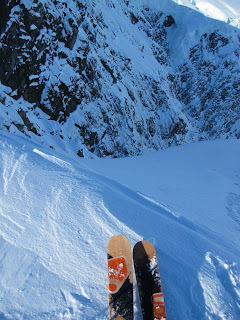 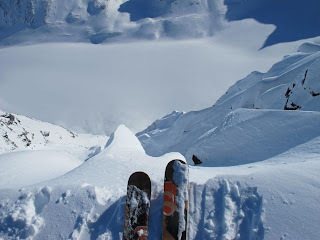 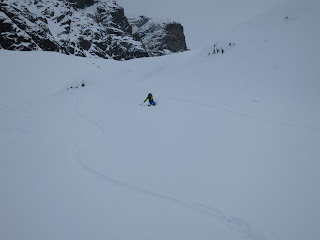 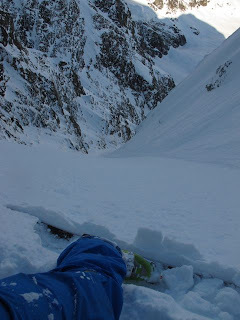 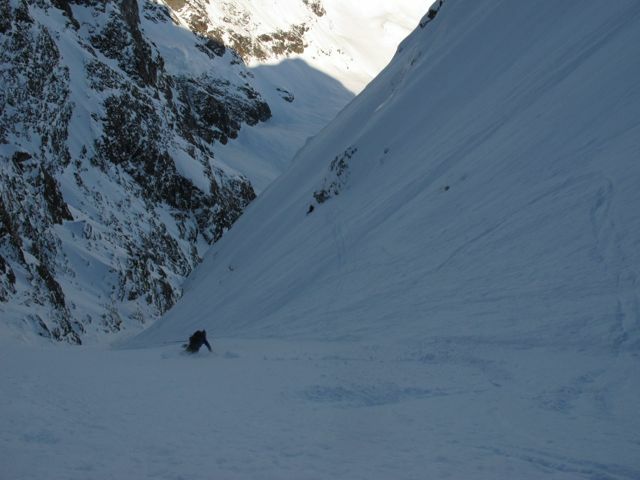 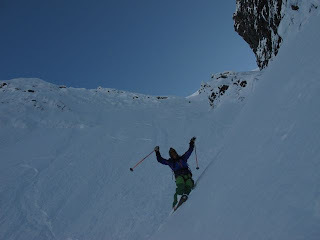 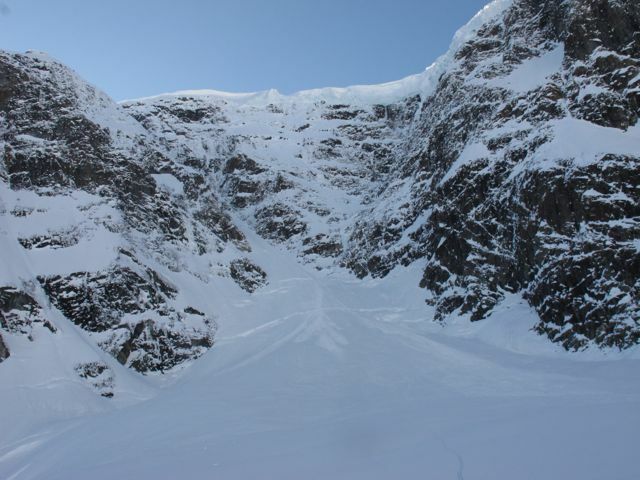 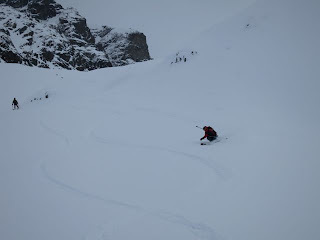 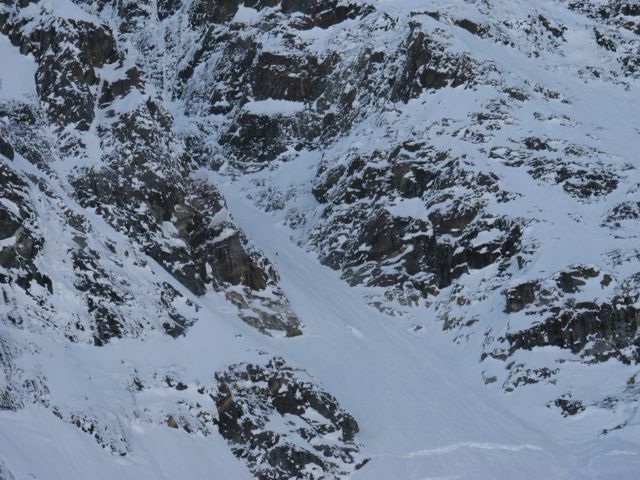 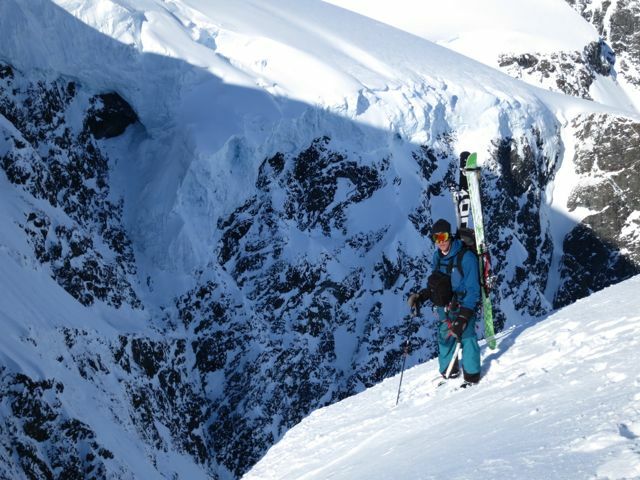 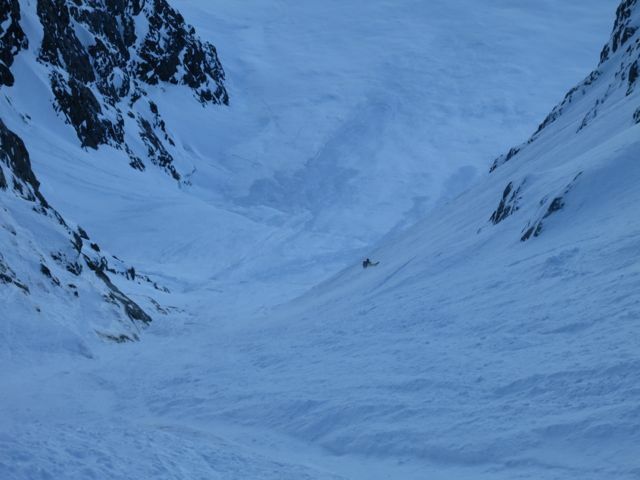 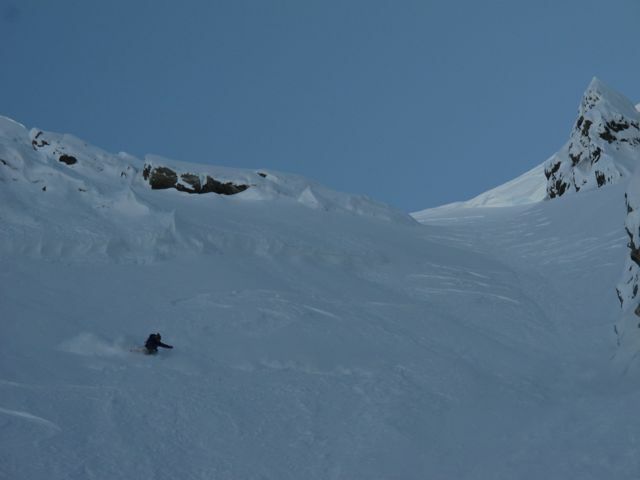 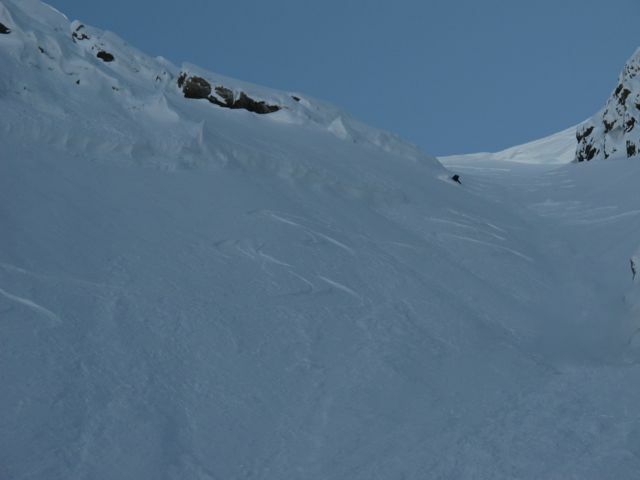 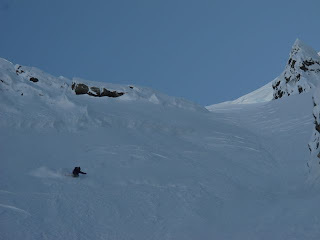 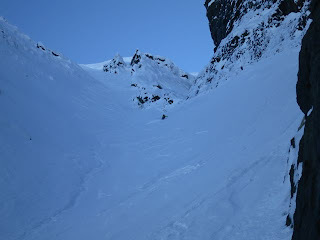 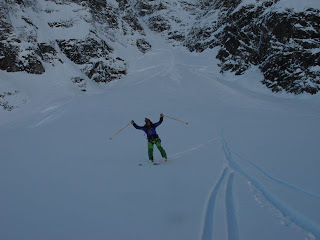 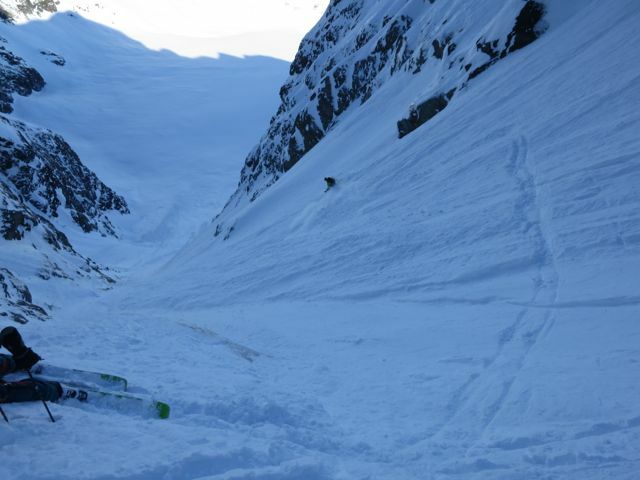 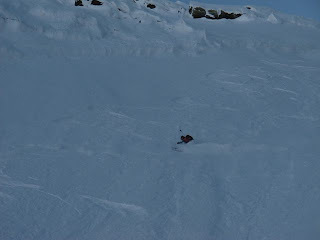 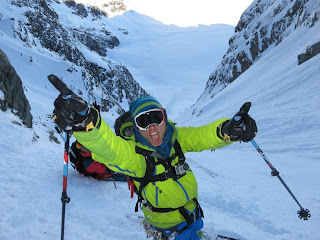 We found the couloir with thirty centimeters of cold powder snow and where totally amazed on how good the skiing was! This adventure should become a future classic for the new generation of mountain skiers. 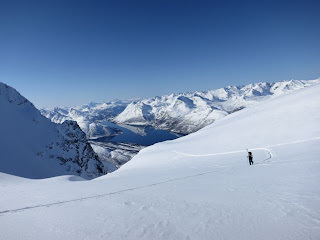 You get to summit the highest mountain on in Lyngen, traverse the whole “island” and ski a fairly easy but grand couloir in big mountain ambiance with seracs looming high above your head (not too bad though, its only for the lower part), then its only about an hour of walking and pushing to get back to the shores on the east side (where you hopefully have parked a car in advance). If the couloir doesn’t have a name already, I suggest Linus’ couloir for the passionate skier Linus Johansson who have already skied part of the line and who pointed it out for us! 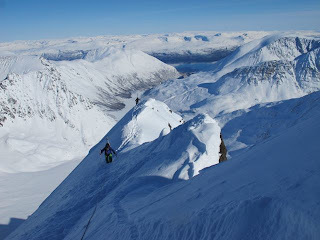 I know people used to climb up this as a climbing route a long time ago, but I can’t really see how this could be considered climbing by modern standards… But whatever name this line will have in the future its still an itinerary that deserve to be a classic in Lyngen. 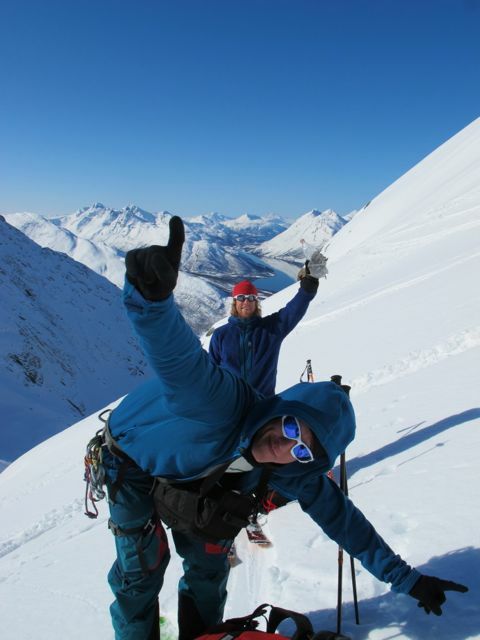 With this one bagged we start to feel like we are done with the big days in Lyngen for this time. 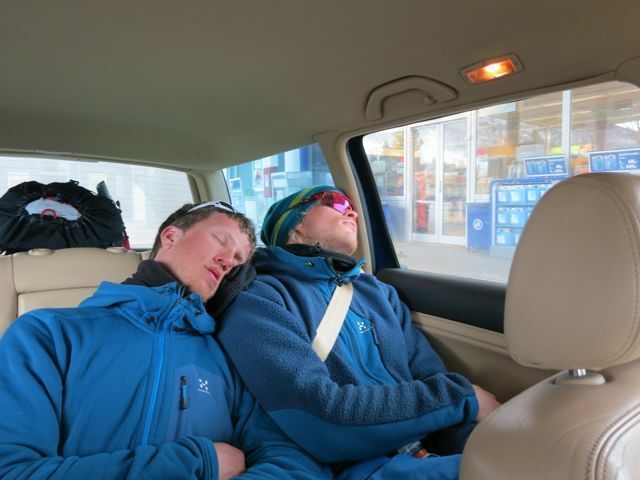 Now its time for some rest, some good powder turns and soon we are of to Cham! 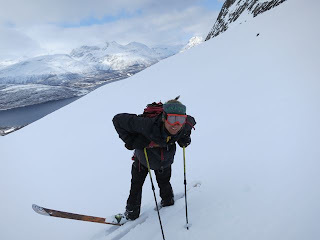 On Monday we went to try Jiehkkevarri, the highest mountain in Lyngen, together with Patrik Jonsson (CEO on Magic Mountain Lodge) and Fredrik Aspö. 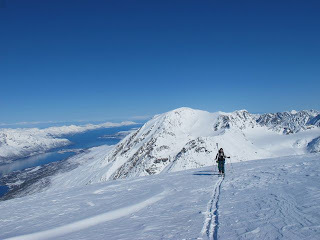 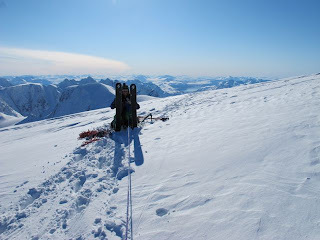 Our intention was to traverse the whole island via the highest mountain on in Lyngen and then try to spice it up on the way down. 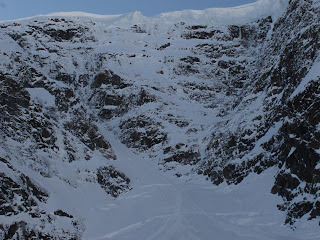 We wanted to check out the south face and we also had a great plan B in mind. 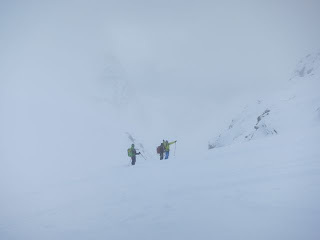 We started out early in the morning in good and clear weather, but the clouds where on their way in. 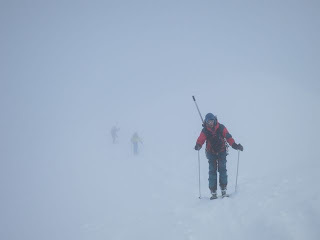 The forecast up here is really unreliable so one just have to wake up and hope for the best in the mornings. 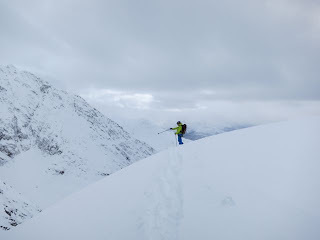 We where hoping that the clouds would disappear while we where walking so we started up the normal route via Holmbuktstind. 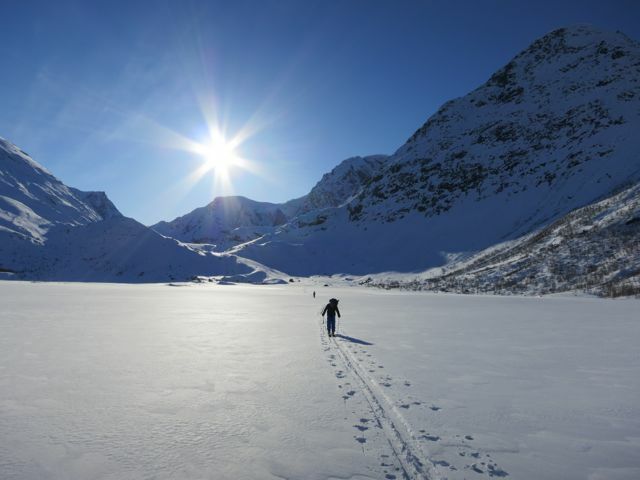 To make a short story even shorter; the weather did not improve – it got much worse and when we where on the big glacier between Holmbuktstind and Jiehkkevarri we could not se much else than each other. 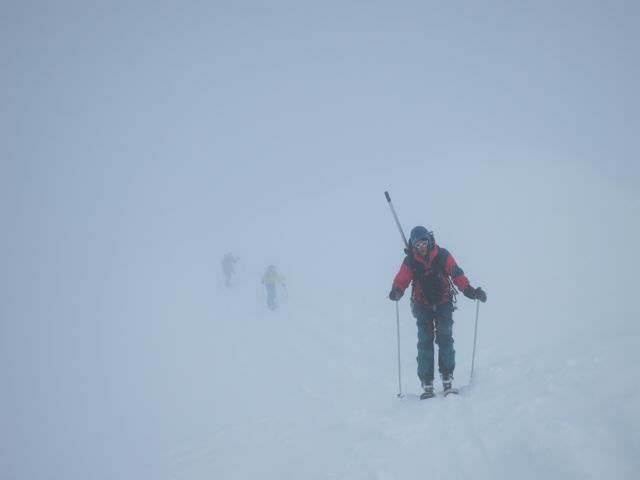 We knew that if we would manage to find the summit (that is hard to find in good weather, because its so flat) we would still not be able to do any kind of interesting skiing. So we retraced our tracks and skied down the same way we had come. 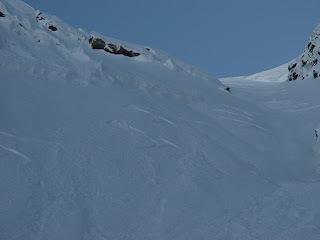 We got some good turns and got back to the lodge in good time for Mintu hot chocolate. It was just another good day in the mountains with around 1700-1800 vertical meters of skinning. 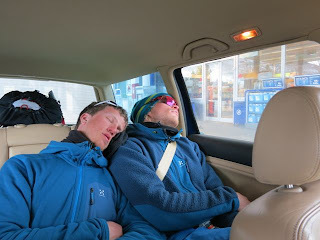 I felt a bit disappointed though, as this one would have been a great ending to our episodes and we did not have many days left.